Our J3 Ergonomic Chair delivers contoured support and high-end features at an affordable price. It's an ergonomic chair for everybody. The J3's breathable mesh backrest provides increased airflow to keep you cool throughout the day. Sitting for extended periods is more comfortable thanks to the synchronized lumbar support and stylish leather seat cushion, which includes a waterfall edge for improved circulation. Smooth and durable pneumatic height-adjustment, an adjustable back recline and tilt tension, an articulating headrest, seat slider, and adjustable height armrests are just some of the additional, premium ergonomic features of the J3. Sharing the J3? Gliding casters mean it moves effortlessly, and a wider seat means it's more comfortable for more users. Seat height 18.7" - 22.3"
How is the J3 different from other UPLIFT Desk chairs? Our designers made the J3 to offer more users more adjustability at a great price. Enjoy its luxurious seat and mesh back, making it perfect for you if you work in a humid environment. If you still need help deciding which chair is right for you, our chair comparison chart lays out all of the features! 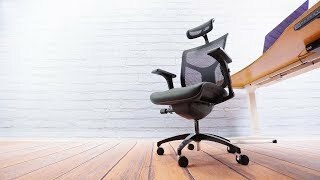 What features make this chair "ergonomic"? The J3 Ergonomic Chair was designed with the utmost in ergonomics in mind. From the casters to the headrest, every feature included on the chair is meant to amplify your comfort levels. Enjoy a more supportive seating experience with the J3! Does this have a mesh seat? No, the J3 comes with a leather seat cushion, which is ideal for most users who sit for more than a few hours everyday. If you're interested in an all-mesh chair with mesh seat, try the Pursuit Ergonomic Chair! How does this compare to the Pursuit? We love the Pursuit Chair due to its supremely breathable mesh back and seat, adjustable armrests, and adjustable, removable headrest! Compared to the Pursuit, the J3 comes with a slightly more heavy duty seat cushion that's slightly contoured and upholstered in leather, so you can sit happy for longer than you could in a mesh chair. In addition, although the armrests are adjustable up and down on the J3, they offer a little less adjustability than the Pursuit. Can I remove the chair's headrest? Yes, the J3's headrest is removable, and can be removed after it has been attached. Yes, the J3 Ergonomic Chair's seat is mildly contoured and covered in supple leather, which makes this a chair that's there to support you throughout your long days spent working. What is the J3's weight capacity? Is it rated for heavy duty use? This ergonomic chair was designed to secure weights up to 250 pounds, which makes this a suitable work chair for most of the population! A mesh back allows you more breathability to your back, so you can work comfortably in hot or humid environments.